The Elite Travel Gal: Yes, We Can...Travel, that is! Yes, We Can...Travel, that is! Tahiti Dreaming? We can help make these dreams come true, even if you don't have much time on your hands. 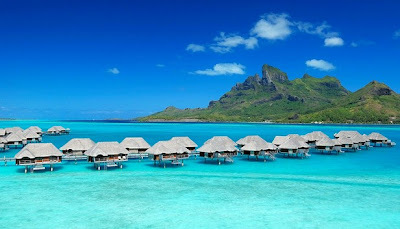 Take a "Tahiti Short Break" and enjoy a five-night stay (one night is free) at the Four Seasons Resort Bora Bora (seen above) in an over water beach view bungalow! Including round-trip air from Los Angeles, all taxes and daily breakfast, the special Elite Travel Gal/Swain Tours package rate is $3,365 per person. Ideal for families are the new Villas at La Samanna in St. Martin (especially with the amazing deals in place). Through Dec. 21, anyone booking four nights in the three- or four-bedroom villa gets one extra free, while those booking 5 nights will enjoy 2 comp nights. If available, an upgrade from the 3BR to the 4 BR will be given. Our special rates include VIP airport transfers, daily private breakfasts, a private concierge, twice daily housekeeping service, a private pool and garden, a private beach cabana, and, during holidays even beach butler service. New Zealand Nice: Enjoy a mix of "Vines & Adventure" in New Zealand, with a 6-night experience inclusive of round-trip air on Air New Zealand (from Los Angeles), internal flights in NZ, and 3 nights and gourmet meals at the world-famous Cape Kidnappers, set on a 6,000 acre sheep and cattle farm on the Eastern Coast on New Zealand's North Island (where the cliff's plunge 800 feet downwards). From here, travel to Queenstown, and enjoy three nights at the deluxe, city-center Spire Hotel. Each of the 10 rooms features a fireplace, modern funky furnishings, a balcony and interactive multimedia system. Including air, daily breakfast, transfers and all meals at Cape Kidnappers, this NZ adventure can be enjoyed for just $3,299 per person. For more ideas on how to celebrate the changing of the guard, contact The EliteTravelGal by clicking HERE.